To give some idea of the archives available for access, we highlight an example below. 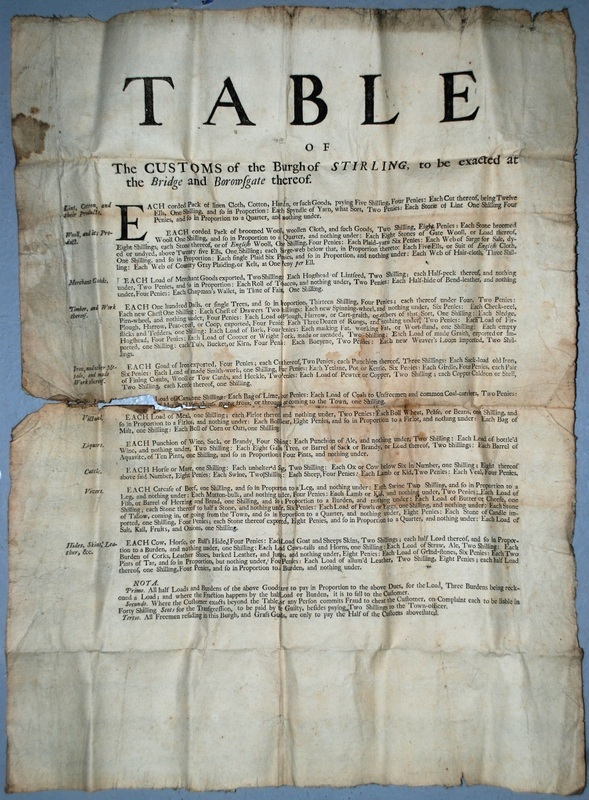 This notice would have been posted at the Bridge (now the Old Bridge) and the town gate to let people know what dues were to be paid for bringing goods for sale in Stirling. It covers all kinds of materials and provisions: cloth, tobacco, timber and furniture, iron and metal work, coals, meal and dry goods, liquor of all kinds, livestock, foodstuffs and skins and leather. a Scots word that refers to fresh foodstuffs as opposed to dry goods, which here appear under the term ‘Victuals’. Strangely enough, this category also includes tallow, candles and salt. 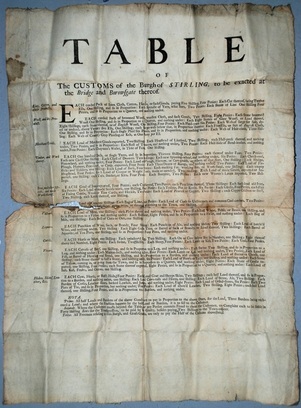 The money made from these customs was paid to the Town Council to be spent on the administration of the Burgh and this notice is held as part of the Town Clerk’s records. The ‘Nota’ or notes at the bottom of the notice are of interest. The first deals with how people are to pay for half loads and how people transporting goods in ways other than bringing them in a cart are to be charged: 3 ‘burdens’( it is not made clear if this is as carried by a beast of burden or a person but is evidently something widely understood) equals one load. The second note deals with fraud. Anyone defrauding the town of the customs payable or their customer of a fair deal is to be liable to a fine of 40 shillings Scots (around £400 today – a hefty fine). The final note indicates that Freemen or Burgesses of the Town of Stirling only had to pay half of the customs outlined in the list. Even at this time, it was advantageous to be a Burgess when trading in Stirling Burgh, as the Guildry and Incorporated Trades of Stirling had a huge influence on commerce in the town.